Freshwater pipefish are not commonly traded but they do turn up in the better aquarium shops from time to time. They belong to the same family as the seahorses, the Syngnathidae, and like seahorses have armoured bodies that make it impossible for them to swim very fast. Closely related to pipefish are the so-called armoured sticklebacks, Indostomus spp., which look very much like tiny pipefish. These were once very rarely seen in aquaria, but in the last year or two have become quite widely traded. Although both pipefish and armoured sticklebacks are fun fish to watch, they are only suitable for the most experienced aquarists. They are not at all delicate, and in fact can do extremely well in aquaria. But the main problem is feeding them, as pipefish usually only ever accept live foods, and will certainly need live foods for the first few weeks of captivity, even if they can eventually be trained to take wet-frozen alternatives. On top of this, the traded pipefish include both freshwater and brackish water species, and these two types of often confused with one another. If you can't identify your pipefish, providing the right water chemistry will be difficult. 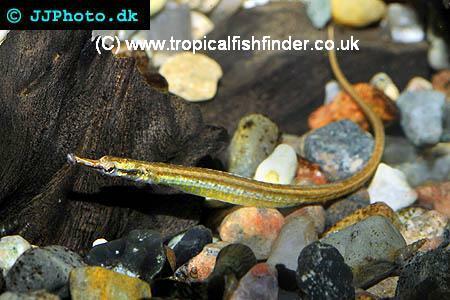 The freshwater pipefish sold in the trade are primarily species from the genera Doryichthys, Enneacampus and Microphis. Historically two African species were predominant, and these are the ones featured in some aquarium books. The most notable of these African species are Enneacampus ansorgii and Microphis smithii, this latter species in fact being Microphis brachyurus aculeatus. Both these species inhabit fresh and brackish water habitats and should do well in both, though the addition of some marine aquarium salt may be helpful when specimens collected from estuaries are being maintained. In recent years though it is the Asian species that are seen in aquarium shops most regularly. Species that appear particularly frequently include Doryichthys boaja, Doryichthys deokhatoides and Doryichthys martensii. Brackish water varieties of Microphis brachyurus may also be imported as well. 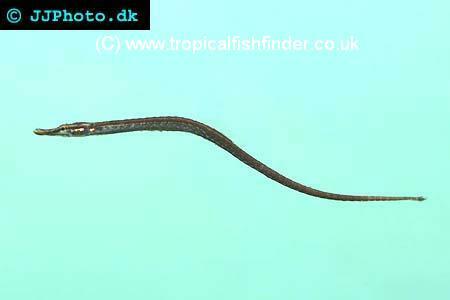 Although sometimes sold as miniature pipefish, Indostomus spp. belong to their own group, the Indostomidae, and are believed to be more closely related to sticklebacks than pipefish. Indostomus paradoxus in particular seems to be regularly, if seasonally, exported from Burma. All pipefish do best in their own aquarium. Space requirements vary from around 30 litres in the case of the very small species Indostomus paradoxus through to 200 litres or more for a school of Microphis brachyurus aculeatus. Tall, grassy plant species such as Vallisneria are very useful for the larger, more active species but will require fairly bright light to do well. Clumps of Java moss are also useful, particularly for the more benthic species like Enneacampus ansorgii that like to forage close to the substrate. The substrate will ideally be sand rather than gravel. Filtration should be moderate rather than turbulent, though poor circulation is not appreciated by these fish at all. Putting aside the brackish water species for a moment, the true freshwater pipefish do not seem to be fussy about water chemistry. Provided extremes are avoided, they can be expected to do well in both moderately soft and moderately hard water; something around 10 degrees dH, pH 7 seems about right for most species. In terms of temperature, slightly cool conditions seem to be preferred by most species, typically 22-25 C/72-77 F.
Specimens collected from brackish water habitats will probably need to be kept in brackish water for long-term success. In this case, a specific gravity around 1.002-1.005 is recommended, i.e., about 5-9 grammes of marine aquarium salt mix per litre. The higher the salinity, the smaller the selection of plant species likely to do well, so set the salinity accordingly. Sometimes a freshwater pipefish will arrive without a scientific name or any information on its water chemistry requirements. Since the freshwater species will tolerate slightly brackish conditions, there's a strong argument for keeping all mystery pipefish in slightly brackish water around SG 1.002 (5 g/l). This will benefit brackish water species without harming freshwater ones, and provide sufficiently good living conditions until the mystery pipefish can be identified. Without exception, pipefish require a steady supply of live foods. If you're not able to provide these on a daily basis, then it simply isn't worth trying to keep them. Pipefish have been trained to take wet-frozen foods including bloodworms and cyclops, and this is certainly worth trying once your specimens are feeding well. Flake or pellets will never be accepted. Depending on the size of the pipefish, possible live foods include adult brine shrimp (though these are not very nutritious), brine shrimp nauplii, daphnia, midge larvae, mosquito larvae, small oligochaete and nematode worms (such as vinegar eels and microworms) and livebearer fry. Pipefish do best when given several small meals per day rather than just one big meal. Some success has been had using floating worm feeders that allow the pipefish to graze on worms before they fall and get lose in the substrate. Pipefish hunt by sight, and movement is what attracts them. Decanting small amounts of wet-frozen foods into a gentle water current a bit at a time should elicit a better response from them than simply dropping the whole block of frozen foods into the tank. Whereas most fish are indifferent to light intensity, reasonably bright light seems to be very important, perhaps because of the way they hunt for food. Pipefish compete poorly with other fish, and maintaining pipefish alongside any other fish species is rarely worth the risk, except perhaps in the case of small suckermouth catfish species that won't take midwater foods; Otocinclus and whiptail catfish, for example. Small shrimp species and snails should be okay too. Most pipefish are gregarious and should be kept in small groups. Indostomus are the exception, these armoured sticklebacks instead being quite feisty amongst themselves, and the males in particular prone to chasing one another out of their (admittedly tiny) territories. Some of the pipefish species have been bred in captivity. The details are similar to those of seahorses, and after mating the males carry the eggs around in a pouch-like structure on their ventral surface, though the degree to which a true pouch forms around the eggs varies from species to species. Once the fry are free swimming the male plays no further role in their care. Pipefish fry will take infusoria immediately, and eventually graduate to the same sorts of foods as their parents. Five Doryichthys species come from freshwater habitats in Southeast Asia: Doryichthys boaja, Doryichthys contiguus, Doryichthys deokhatoides, Doryichthys heterosoma and Doryichthys martensii. Of these, three come from Malaysia, and as such may be traded under the Malayan Freshwater Pipefish name that seems to account for many of the pipefish sold in the UK. These three species are Doryichthys boaja, Doryichthys deokhatoides and Doryichthys martensii. Doryichthys boaja is a large (to 40 cm) species that has an ochre-coloured upper surface and silvery ventral surface. Along the flanks are bluish-white vertical stripes that usually have small black spots at the top. In between the vertical stripes are brownish bands. The snout may have a few indistinct black speckles. Doryichthys boaja is a strictly freshwater species that frequents rivers and streams. Doryichthys martensii is similar to Doryichthys boaja but smaller (to 15 cm) and has much more pronounces black markings on its snout, forming a more obvious band running through the eye. It is also a strictly freshwater species. Doryichthys deokhatoides is a greenish-ochre coloured fish that is darker below than above. The black band run from the snout through the eye and onto the flanks is much stronger on this species than on the preceding ones. It gets to about 18 cm in length. Again, this is a strictly freshwater species. Doryichthys heterosoma and Doryichthys contiguus do not appear to be routinely traded. Enneacampus ansorgii is a small, reddish-brown species from Africa. It usually has an orangey-red snout. Older aquarium books refer to this species as Syngnathus pulchellus. It comes from both freshwater and brackish water habitats. In shape it is rather worm-like and it likes to spend most of its time close to the substrate, often resting on the sand. Two species in this genus are traded, Indostomus crocodilus and Indostomus paradoxus. Of the two, Indostomus paradoxus is by far the most regularly seen. The maximum length of this species is only 3 cm, and it can do well in tanks as small as 30 litres. As with other pipefish, live foods are a must, and because this species is so small, we're talking really tiny live foods, brine shrimp nauplii for example. A smaller version of the common water flea, Moina spp, also works well. In the wild their diet also includes small annelid worms. While feeding them can be difficult, water chemistry does not seem to be of critical importance, though as with the other pipefish extremes should be avoided. Like true sticklebacks, Indostomus are territorial and should not be overcrowded. A planted tank is a must so that individuals can hide from one another as required. Indostomus paradoxus has been bred in captivity, and follows the typical stickleback pattern with males making nests inside caves (hollow bamboo tubes are favoured) and then protecting the eggs until the fry are free swimming. Needless to say the fry are tiny, but in mature aquaria with gentle filtration at least a few in each batch seem to get by on the infusoria they find inside the tank. 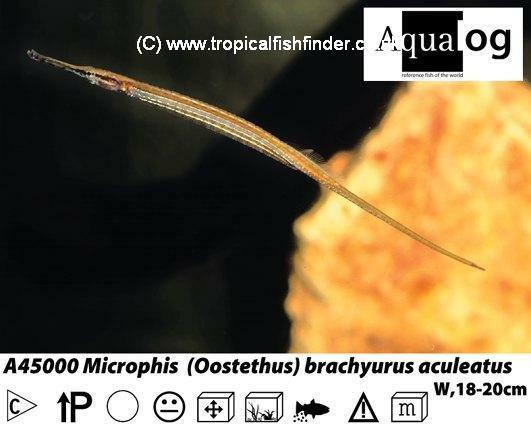 The Greater Freshwater pipefish Microphis brachyurus aculeatus was formerly known as Microphis smithii, and that is the Latin name often associated with this species in aquarium books. It is one of a complex of closely related pipefish that inhabit marine, brackish and freshwater habitats. This species at least appears to do better in hard, slightly brackish rather than completely freshwater conditions. Basic colouration is ochre but with dark speckles on the snout forming a row that leads through the eye and about as far back as the gill covers. Maximum length is about 20 cm. Microphis deocata is an infrequently seen species from South Asia. It gets to about 15 cm in length. Both sexes are greenish-gold, but males have red and blue bands on their abdomen. In breeding condition this region expands dramatically and is used for display.